With both Asian Games village and Olympic Park as its neighbors, Yayuncun Hotel is only few minutes walking distance from the “Bird’s Nest”. The room rate includes 1 or 2 breakfast, service charge and taxes. 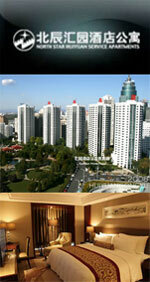 Huiyuan Prime Hotel is only 27 km to Capital International Airport and 20 km to Beijing West Railway Station. 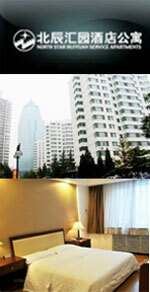 The hotel offers easy access to the neighboring key destinations, like Minzu Park. 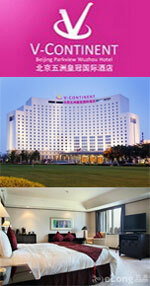 Beijing North Star Continental Grand Hotel is a large four star hotel with 538 elegant and comfortable rooms. The guest rooms are renovated recently, representing advanced technology which demonstrates the international quality and hospitality. V-Continent Beijing Parkview Wuzhou Hotel is adjacent to the Beijing International Convention Center, one kilometer from Olympic Park and eight kilometers from Beijing city center. The 25-story Celebrity International Grand Hotel is located just north of the Anhui Bridge over North Fourth Ring Road in Beijing. It is about three blocks from a subway station and 25 kilometers from Capital Airport. 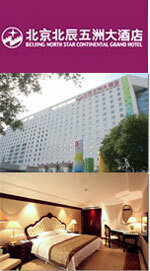 Yuanchenxin International Hotel, is a four star business hotel. It is located at the northern area of the city, right at the junction of the North 3rd Ring Road and the Expressway linking to Badaling Great Wall, convenient to the relic of the capital of the Yuan dynasty in ancient China,and adjoin the China International Science Technology Convention Center(CISTCC). Dist. to BICC Take the Bus 658 from Jiandemen Bridge North Station to Yayuncun Station.